Can you tell that we have been on a sweet potato kick lately in our house? We buy them much more often than we used to because our son LOVES them. As a result, I am constantly looking for new and fun ways to make them so that we’re not just eating baked sweet potatoes every week or steamed potatoes. These sweet potato muffins are a sweet and savory combo, satisfying but not too sugary. They are loaded with fruit and vegetables (apple, sweet potato) and a decent amount of fiber too. Their texture is moist, but holds true to muffin shape once cooked. The other main ingredient in these muffins is quinoa flour. I used quinoa flour because it offers different nutrients than rice flour or millet. Not to mention it is an easy way to get quinoa into my 9 month old’s diet since he can’t eat the traditional way. If you’re not a fan of quinoa flour, it is okay to use something else — but, I can’t guarantee that the texture will be the same if you use something else. I encourage you to experiment though if you want a different flavor or just don’t have quinoa flour in your pantry! By the way, if you’re not a sweet potato fan, you can swap it out for pureed pumpkin instead. Who doesn’t love something with pumpkin in it this time of year? Whether you do them as sweet potato muffins or pumpkin muffins, these are a nice way to celebrate fall. gluten, dairy, egg, and soy free. No nuts included but coconut is used. Preheat your oven to 400 degrees. Prepare either a muffin pan or small ramekins with cooking spray. I didn't use muffin liners because I used ramekins; I like the presentation better that way. Bake or steam your sweet potatoes, ahead of time is best to make this recipe quick and easy. You'll need 1 cup of soft sweet potatoes for the recipe. Place in a food processor and blend for a few seconds to get a soft and creamy texture. 5-10 seconds is likely adequate. Scoop out into a medium mixing bowl. Add in your flour, applesauce, oil, sugar, xanthan gum, vanilla, baking soda, and cinnamon. Mix with a large spoon or rubber spatula until you get a well combined dough. If your texture is moist and easy to smoosh, you do NOT need to add the water. But, if your mixture is a little dry or thick, add in the water and give it a stir again. If you need to add a little extra water to get the consistency just right, that is fine. Make sure your ramekins or muffin pans are sprayed with cooking spray so the muffins won't stick. Fill the dishes or muffin pan 3/4 of the way so they have room to grow in the oven. Bake at 400 degrees for 20 minutes or until a toothpick comes out clean. Let them cool for a few minutes, then add a dab of non-dairy butter (1/2 a tsp or so) to the top of each muffin. You can serve these warm or cooled, but they are best when slightly warmed up. Store in the fridge for up to 3 days. These are slightly larger in the ramekins than a regular muffin tin/pan. The recipe yeilded 4 ramekins for me. You will likely get 6 muffins if you use a pan instead. 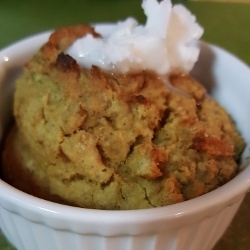 You can substitute pumpkin puree for sweet potatoes and you can try using a different flour - just be aware the texture may be different if you change the flour. This looks yummy – I can’t wait to try them! Thanks James! I hope you enjoy them.